I used to work for a newspaper and got pretty darn good at writing on deadline (whether or not it was good writing on deadline is another story, of course). I'm now up against a March 3 deadline for my Salsa (mild) top, and I don't know if I'm going to make it. Yikes! The back and both fronts are finished only up to the armholes, and the thing is supposed to have two long sleeves...time will tell. Maybe I can do the finishing on the plane! I think I have a plastic darning needle that would work. My Polo Pumpkin! The second sleeve still has an inch of its seam missing, but we'll get there. OK. Pictures! Whew. Now I feel like a real blogger. Workin' away on my beach coverup, a variant of Salsa from Rowan 33. I really love this Linen Drape! But I think my next project will have to have something other than miles of stockinette, drape or no drape. I have been thinking for some time now that "the next project" will be an aran-esque sweater...there's one I think I like in the new Rebecca, but for some reason I get a little nervous about trying to find the yarn for Rebecca sweaters. 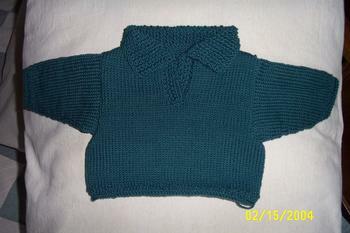 The one I like is shown in a rich blue yarn -- it's got cables, a v-neck, and a collar! Sounds pretty over the top when I type it out, and I've seen only the little photo on the website, but I am intrigued. Why a beach cover-up, when I live in Chicago and it's February? I'm glad you asked! Because my wonderful husband and I are leaving for a few days in Cancun in just a couple of weeks! Our 10th wedding anniversary will be this August, but we're celebrating early. It was funny -- one night in January at dinner we discussed (in sort of a "la la la" way) taking a trip at the beginning of March, and three days later rooms were reserved, tickets were bought, and passports were dusted off! Somewhat unlike us. I'm really excited. We haven't done a "lie around on the beach trip" since our honeymoon in 1994! And lying around on the beach is one of my all-time favorite activities (besides knitting)!! So it should be great. We could both use the break, too. All I have to do is finish up about an inch of the second sleeve's seam on Polo Pumpkin and off it goes! I think the baby will actually be able to get more than a week's wear out of it, but let that be a lesson to me. Still no pictures. Boo. I have to get the tech-savvier member of the household to help me figure this out. Introducing my other recent projects: I just finished Maggie from Rowan 31 (I believe that's the number) in Kidsilk Haze. Boy, do I love this sweater! Yes, OK, I'll admit it -- I do wish I had made it one inch longer, but I'll still wear it a lot, when I can get away with it. I wore it to a big, semi-fancy dance right after I finished it, and it was well-received. I am fighting the urge to make 17 sweaters (which would bankrupt me, if nothing else) out of this yarn. It just feels soooo great on. I have this same feeling about Linen Drape -- I happen to think at the moment that all my summer tops should be made of Linen Drape. This is unfortunate for me, since Rowan is discontinuing it. Waaah! Apparently not everyone is as enamoured of it as I, which I can understand. Some might perceive an uncanny resemblance to utility twine...but I've always loved linen, and I love this ole yarn. At the moment I'm making a cover-up for the beach that is a marriage of Salsa from Rowan 33 and Enchant from Rowan 29. Actually, it's more accurate to say that it's Salsa sans lace trim, an idea that came to me as a result of loving Enchant but not loving the slits on the side, which interfered with my desire to knit it in one piece. I initially cast on all the pieces separately and joined them at the point where you'd start the side seam, were you seaming, but it really wasn't working out for me. So what we have here is a Linen Drape long-sleeved cardigan with a moss stitch at the lower edge and three stitches of moss stitch at each edge. Color: Natural, thereby enhancing its resemblance to the hardware store's finest. But I still love it. I got caught up in knitting for myself (results soon) and let a sweater for a newborn languish. Blast those babies for growing so fast! It was not my best move. It's now back on the front burner, though, and is just about finished. The yarn is teal-colored Rowan Wool Cotton, and it's basically the Pumpkin pattern from Kim Hargreaves' Pipsqueaks -- a pullover with a v-neck-with-plackets (I'm sure that's not what you call it) and a moss-stitch hood. I love this pattern, and indeed the whole darn book, and made Pumpkin as written (plus one or two idiosyncratic mistakes) in the fall for one of my nieces. The recipient of the teal number, on the other hand, was born in December, and I made the smallest size, so time is not on my side. My time-saving alteration was to stop knitting the hood at the point that it began to resemble a polo-type collar. I'm getting this in the mail soon. The baby lives about a mile and a half from me -- how pathetic is mailing a sweater to a baby in the next neighborhood over??? I have got to get my life together. I do have a picture of the Polo Pumpkin for u to dig (if u will). Work will commence on getting it from the hard drive of one computer into a photo album being saved on another computer...sigh...I have a lot to learn! So, inspired by many knitting bloggers, but particularly by the incomparable Chicago-area luminaries Bonne Marie, Carolyn, Theresa, and Heidi, I'd been itching to start a knitting blog for months -- and now that I have one, I can't settle on what to say! Typical. My husband, Clark, who didn't even know what a blog was until I started reading (entirely too many) knitting blogs every day, has already posted FOUR times to his blog, HealthyTension. He's the other, pundit-ing half described up there in the banner. I wanted to call the blog "Hypertension" because I tend to be a tight knitter and I think it's cool that the British tell you to check your tension instead of your gauge. And, truth to tell, I have been known to act in a rather hyper way. Giddy/hyper, but nonetheless still hyper. Clark pointed out, however, that we might get a lot of people looking for information on heart disease and high blood pressure. I had visions of these poor people getting angry at ending up here, thus raising their already high blood pressure even higher. I don't need that kind of tension, so "healthy tension" it is. The talent, wit, good sense and generosity of the knit-blogging community really bowls me over, and I'm eager finally to quit lurking once and for all and start posting! I can't promise that I'll be making any measurable contributions either to this fun community in particular or to the world's body of knitting knowledge in general, but I'm just happy to be here.